This holy treasure I lay in the hands of the youth of Turkey. Turkish Youth ! 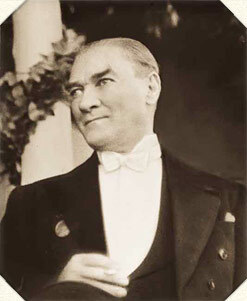 your primary duty is ever to preserve and defend the National independence, the Turkish Republic. That is the only basis of your existence and your future. This basis contains your most precious treasure. In the future, too, there will be ill-will, both in the country itself and abroad, which will try to tear this treasure from you. If one day you are compelled to defend your independence and the Republic, then, in order to fulfil your duty, you will have to look beyond the possibilities and conditions in which you might find yourself. It may be that these conditions and possibilities are altogether unfavourable. It is possible that the enemies who desire to destroy your independence and your Republic represent the strongest force that the earth has ever seen; that they have, through craft and force, taken possession of all the fortresses and arsenals of the Fatherland; that all its armies are scattered and the country actually and completely occupied. Assuming, in order to look still darker possibilities in the face, that those who hold the power of Government within the country have fallen into error, that they are fools or traitors, yes, even that these leading persons identify their personal interests with the enemy s political goals, it might happen that the nation came into complete privation, into the most extreme distress; that it found itself in a condition of ruin and complete exhaustion. Even under those circumstances, Turkish child of future generations! it is your duty to save the independence, the Turkish Republic. The strength that you will need for this is mighty in the noble blood which flows in your veins.